I have been learning Japanese (日本語) for approx a year. I have been using a tutor/teacher (先生) for around 1 hour a week. The best way to start is to get straight into the Hiragana (ひらがな) chart..
Repetition is the key… keep writing until it sticks!! Understanding how to pronounce words is essential!! After visiting Japan I wanted to learn the language and started having a tutor/teacher once a week. This I believe is a very good starting point although definitely not essential as there is so much material available at your fingertips on the net. I found having a tutor great as any questions or confusions I had regarding Japanese I could ask and knew that my answer was going to be correct. 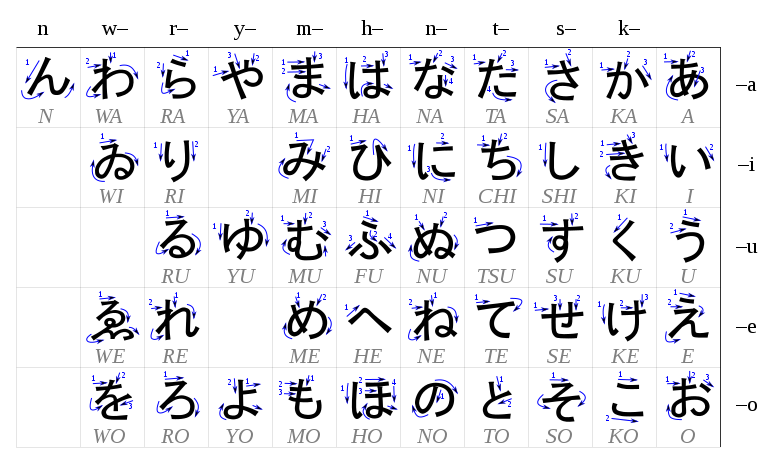 Hiragana (ひらがな): Used very frequently and normally accompanies Kanji to form words. Katakana (ｶﾀｶﾅ): Another form of Japanese writing used for foreign words eg. toilet, credit card etc..
Kanji (象徴): Thousands of Kanji which are used the most throughout Japanese writing. Two other forms are Romanji and Furigana. Furigana is Hiragana which sits on top of Kanji, you will normally see this in magazines eg. anime etc. This should be enough to get you started… Also here is a few websites that you might find interesting and helpful..